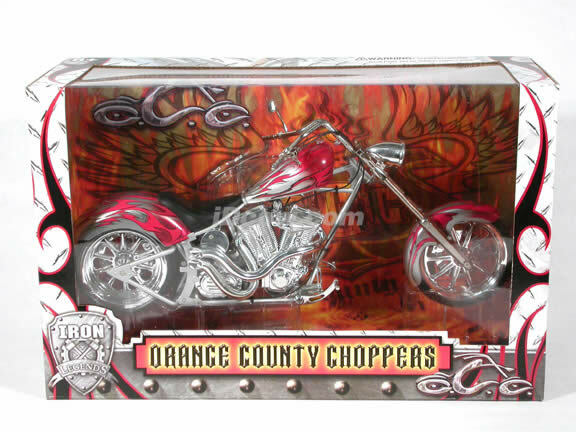 Beautifully crafted Orange County Choppers Diecast Chopper Model 1:6 scale die cast motorcycle by Toy Zone. Great replica in scale. This is a very highly detailed Orange County Choppers Diecast Chopper Model 1:6 scale die cast motorcycle by Toy Zone. Every details are well put together. Great collectible or gift piece. Orange County Choppers Diecast Chopper Model 1:6 scale die cast motorcycle by Toy Zone is one of the best showcase model for any motorcycle enthusiasts. This model is only available with UPS Ground or USPS Priority due to its¢®? size. If other shipping option is selected, we will adjust it accordingly.